iPont Shuffle - Life is Random: Medium-Rare, I Said! One of the joys of parenthood is that if you don't screw things up too badly in the early years, you can eventually start handing over some of your chores. Don't really care for mowing the lawn? There is probably an 11-year-old who will be happy to do it. And if that 11-year-old happens to live in your house, you just hired yourself a free landscaping service. 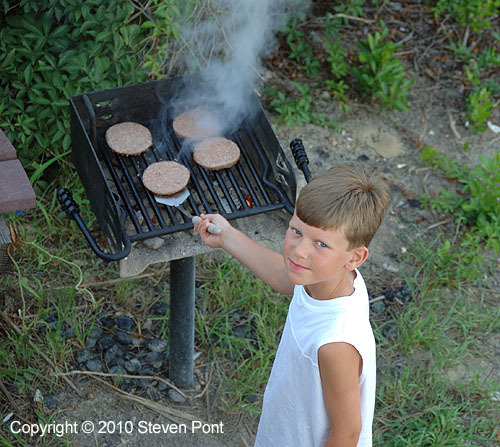 The same goes for grilling up some burgers, taking out the garbage, washing the windows, and cleaning the gutters. Now I finally understand why my parents never kicked me out. that's some fine grillin' technique. Did you take the kid's milk money playing poker?